The European Parliament, Commission and Council have agreed to start talks in early 2018 on setting up joint rules that will bring more transparency to the activities of interest representatives at the EU level. Since 2011, the Parliament and the Commission have jointly operated a public register called the transparency register. This one has replaced previous separate registers, the Parliament’s one having dated back to 1995. The Council has been an observer to the current scheme since 2014. The new agreement to be negotiated between the three EU institutions is expected to result in the full participation of the Council. The aim of the transparency register is to ensure that those seeking to interact with EU institutions get to declare their interest publicly and provide information about themselves. Registration is voluntary, but may be necessary for certain types of access. For example, if you want to speak at a public hearing organised by a Parliament committee, you need to register. As our infographic shows, the number of registered organisations has been growing steadily over the years. There are now more than 11,000 organisations with more than 80,000 staff, including non-governmental organisations, business associations, companies, trade unions and consultancies. Organisations vary substantially by size and topics of interest. Nearly a fifth of all organisations have their head office in Belgium. 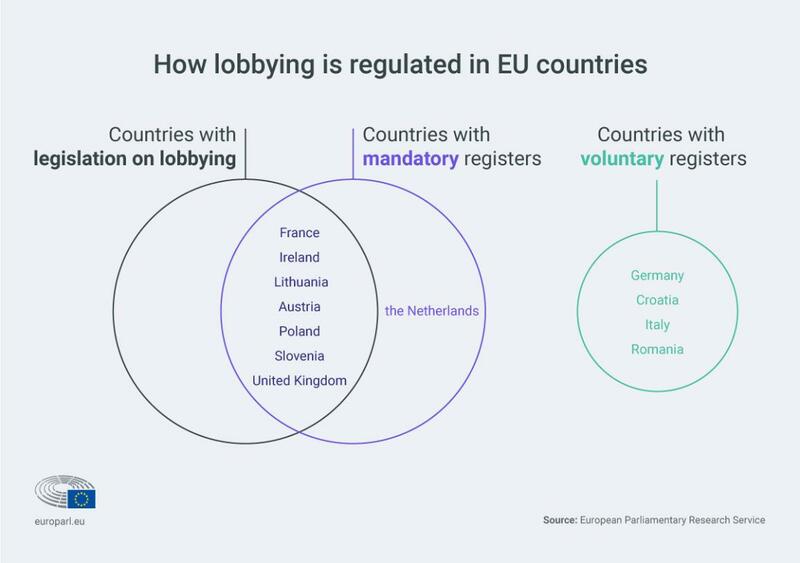 EU countries have different approaches towards regulating lobbying, with only seven countries (France, Ireland, Lithuania, Austria, Poland, Slovenia, UK) having passed legislation on the issue. The European Parliament’s mandate for the forthcoming negotiations with the Commission and Council, which was adopted by the President and the group leaders, seeks to reinforce and improve the accountability of EU institutions and ensure a transparent and open decision-making process at the EU level. “Parliament’s policy of openness is the approach we want to adopt during the future negotiations,” said French S&D member Sylvie Guillaume, one of the Parliament's two negotiators on the issue, in June 2017. “The European Parliament has always been a leader in the debate on transparency. Now is the time for all EU institutions to demonstrate unity in their approach," added Polish EPP member Danuta Hübner, the other lead negotiator.